AUSTRALIAN SUPERYACHTS, exclusive distributor for Gulf Craft Majesty Yachts, has greatly expanded their team, offices and clientele and relocated their head office to the stunning Jones Bay Wharf in Sydney. Making the investment in its team with a number of significant additions to senior management Australian Superyachts has expanded their Sales, Charter and Management headquarters with the purchase of the former JW Marine office in historic Jones Bay Wharf in Pyrmont. The company will continue to maintain a permanent presence at Sydney Superyacht Marina in Rozelle Bay where it has been based since 2009. The Yacht Agency division, Australian Superyacht Services will remain based at the marina complementing its recently opened Cairns office. Richard is assisted by General Manager Sean Anker; a veteran large-yacht expert with experience as Chief Officer aboard some of the world’s largest and most significant superyacht construction projects to his name. Sean heads up the Yacht Management and Technical / Project Management divisions. Recent new senior appointments include Geraldine Gitsham as Director of Charter Management. Geraldine has over 20 years of experience in the superyacht industry, and has worked for the most prominent yacht brokerage companies throughout her career, including Camper & Nicholsons in Monaco as a Charter Manager. Penelope Taylor joins the company as Operations Manager. A former Chief Stewardess and Purser aboard very large superyachts, Penelope’s expertise and years of experience in operations and yachting makes her one of the company’s most valuable members of staff. Naval Architect Greg Carmody joins the technical and yacht management team. He brings experience sailing aboard superyachts in the Mediterranean and working for a naval architecture firm in Holland designing Oceanco superyachts. Greg leads the new build, refit and commercial survey departments. The recruitment and training arm of the company, Superyacht Crew International, has also relocated to the Jones Bay Wharf address. Headed up by founder Donna Morris, her company won the prestigious Australian Superyacht Industry Awards Business of the Year Service Provider in 2015 due to its ability to deliver the highest calibre of crew to superyachts globally. As Business Development Manager for Australian Superyachts, Donna ensures synergy between the two companies and client’s needs. As one of the largest and most comprehensive superyacht companies in Australia, with offices in Cairns and Sydney, Australian Superyachts is passionate about bringing only the best of the superyacht industry to Australia. 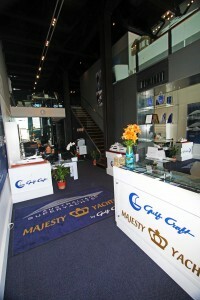 Australian Superyachts are the exclusive Australian distributors for Gulf Craft Majesty Yachts; high quality superyachts up to 30 – 48 metres, all delivered to the exacting highest commercial standards of Commercial Class, the MCA Large Yacht Code LY3 and Australian commercial vessel survey. In addition to assisting clients with their commercial yacht upgrades, Australian Superyachts offers complete turn-key yacht management, charter central agency and crew services.